At least seven people were killed yesterday in Gambella town, south of Ethiopia, during an attempted prison break. 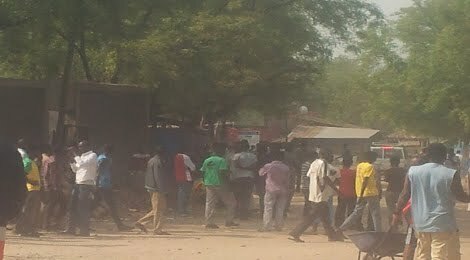 Eye witnesses told Addis Standard that a fierce clash between the Nuer and Anywaa ethnic groups also left scores wounded when hundreds of Nuers attacked a prison called Gambella regional state correctional facility and located in an area locally known as “4 Kilo” in Gambella town. (Pictured above). A victim who was stroke by an iron bar on his eye and is admitted to Blue Vision hospital here in Addis Abeba told Addis Standard that the prison cell was “completely overpowered” by dozens of Nuers armed to “their teeth.” “The area feels like it’s stateless,” he said speaking from his hospital bed. Clashes started around ten days ago after two individuals belonging to the two tribes quarreled over land. Dozens of Nuers were arrested following the clash that tensions spiraling out of control. After heavy gun fires that lasted for hours yesterday, calm has returned to the town today, the eye witness said. Several embassies and foreign organizations based in Ethiopia have issued travel warnings to their staffs following the clashes.